Hey guys! 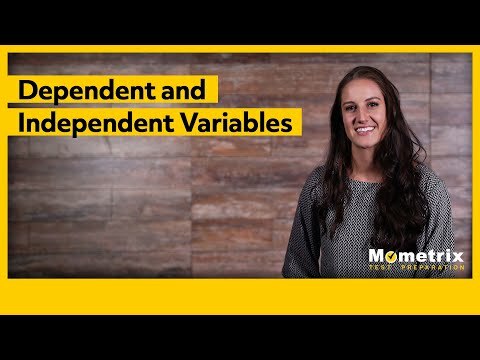 Welcome to this video over independent and dependent variables. There are two primary variables in a scientific experiment: the independent and dependent variable. The Independent variable is the variable that is controlled throughout the experiment, but it is not affected by any other variable. So, like its name suggests it is independent from other variables. Time, for example, will always be an independent variable. Let’s say you wanted to test how tall a tree would grow after eight months of treating it with a certain type of fertilizer. The height of the tree may change, and you can change the amount of fertilizer, but that will have no effect on the eight month period. You can never speed up time or slow time down. It will always be independent from anything we do. However, you can change the amount of time you are measuring something. The dependent variable is the variable being tested. The dependent variable depends on other factors. In our last example we said, “how tall will a tree grow after eight months of treating it with a certain type of fertilizer?” Well, the height of the tree is our dependent variable. It is dependent on the amount of time, the type/ amount of fertilizer, as well as other things like the region it’s growing in, temperature, and so on. It may also be helpful to think of the independent and dependent variable in the same vein as cause and effect. If the independent variable is changed, then an effect will be observed in the dependent variable. Both the independent and dependent variables may change during the duration of the experiment. However, the experimenter is in control of changing the independent variable, but not the dependent variable. The dependent variable soley changes under the influence of the independent variable. When graphing it is sort of a consensus that you would always use the x axis to plot the independent variable, and the y graph to plot the dependent variable. However, some people don’t, and that is why it is so important to label your axes! I hope that this video was helpful! If you enjoyed it, then be sure to give us a thumbs up, and subscribe to our channel for further videos.